Totally not going to lie, I was looking for a quick read in between paper and proposal writing for school. I had no expectations for this book except that I thought I would finish it quickly. Stopping monsters is no job for a princess. 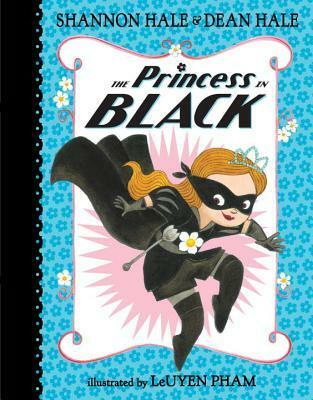 “But luckily Princess Magnolia has a secret: she is also the Princess in Black.” And she is prefect for the job of stopping monsters. I thought this was so much fun! I adore the concept – a “super hero” princess who fights monsters! This is definitely a book for fairly young readers, it took me less than 15 minutes to read but I was smiling the whole time so I call that a win. The illustrations really helped to sell the story and bring it to life. I think a young kid would really enjoy this. This entry was posted in Children, Fantasy, Monsters and tagged Children's literature, Dean Hale, LeUyen Pham, Princess Magnolia, Shannon Hale, Super hero, The Princess in Black. Bookmark the permalink.